Did you overdo it during that last absinthe party? Did the absinthes get stronger as the will weakened? Are you truly regretting it this morning? 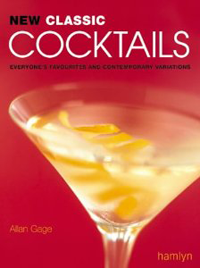 Before you get into this pickle, read this interesting The New Yorker article on drinking, hangovers and cures. 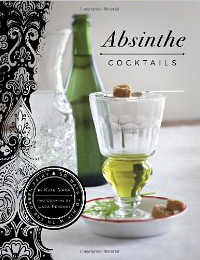 While some claim that drinking absinthe avoids a hangover, we're not convinced! Some words for hangover, like ours, refer prosaically to the cause: the Egyptians say they are â€œstill drunk,â€� the Japanese â€œtwo days drunk,â€� the Chinese â€œdrunk overnight.â€� The Swedes get â€œsmacked from behind.â€� But it is in languages that describe the effects rather than the cause that we begin to see real poetic power. Salvadorans wake up â€œmade of rubber,â€� the French with a â€œwooden mouthâ€� or a â€œhair ache.â€� The Germans and the Dutch say they have a â€œtomcat,â€� presumably wailing. The Poles, reportedly, experience a â€œhowling of kittens.â€� My favorites are the Danes, who get â€œcarpenters in the forehead.â€�. gummi bears - now this we would like to try! 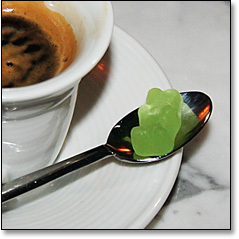 Unfortunately, these sweet little absinthe gummi bears seem to be only available at the source, which is a restaurant called Tailor in New York City. Anyone want to swing by 525 Broome St and get us a few will have us forever in their debt! lollipops - we have written about these beforeand we just wanted to add that they are, in fact, as delicious as they sound. Worth the splurge. lip balm - the description is filled with the annoying marketspeak that tries to sell up absinthe's checkered past - "magickal"(sic), "aphrodisia", "disturbing", etc. So we hate to even point this out, but in the interest of completeness, we'll add it to this list. Cool handmade wine "charms" - old-fashioned absinthe posters inside of bronzed, vintage bottle caps! You know, those little things you put around the base of your glass when at an absinthe tasting party, to make sure no one steals a sip from your glass. 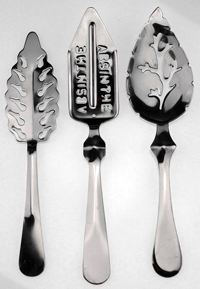 Be sure to click on the 'absinthe' tag at the bottom for more cool absinthe-related stuff. This set of beautiful, unique and collectible wine and beer glass charm's feature vintage images of vintage illustrations of absinthe liquors.